1. 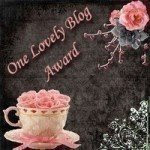 Accept the award and post it on your blog, along with the name and link of the person who sent it to you. 2. Pass the award to 15 other bloggers that you have newly discovered, then contact them to let them know you have passed it along. You're not following the rules!! Just kidding but if you don't mind changing the link since it's wrong. Sorry Kelly. It's fixed now.